1930. 16 page brochure self-published in New Jersey USA as advertising material for Ralph's landscape gardening business. When I Make A Garden. Ralph Hancock. First edition 1935, second expanded edition, 1950. 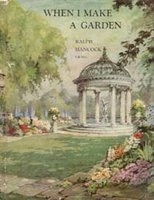 A richly illustrated account of many of the gardens Ralph designed in the UK and USA. Includes examples of show gardens as well as those that he constructed for clients. The locations of most of the gardens are not identified in the text - much detective work is needed to find these "missing" Hancock creations. Copies of When I Make a Garden are always available to purchase at online booksellers. Abe Books always have a good selection for sale. Welsh Living, Spring 2007 edition. Western Mail, 17 April 2007 (Author: Bob Priddle). Derry and Toms 1828 - present (Information sheet by Becky Burns, Head Gardener, The Roof Gardens, Kensington). We gratefully acknowledge the original research undertaken by Bob Priddle and the students of Neath and Port Talbot College Horticulture Department, Garden History Course 2006-2007 and in 2008, for information that Bob provided to the Oxford Dictionary of National Biography .